Ahhhh, so glad to have a few days with nothing to do. :) Don't get me wrong, I just LOVE that my girls are so involved. Wish I would have had all those options when I was a kid. Now that K's birthday is over we are gearing up for L's birthday. We are actually going to have two parties for her although only one is going to be in town. She had several friends from Bloomington that she wanted to have at her party and the dates just weren't working out. We decided to have a party with her B-town friends at a trampoline place in Indy. It will be perfect. All of them are either gymnasts or used to be gymnasts. So the kids can jump and the parents can catch up. So excited to see all of these dear friends again. The following weekend we will have a few of L's closest friends from here in town over for a sleepover. Nothing too elaborate, lots of junk food, a few games (she loved the ones K did at her party so that will be easy) and maybe a movie. Speaking of friends, seriously looking forward to seeing friends from Bloomington on Thursday. One K's good friends from Bloomington has family who live here and they are coming into town for a visit. We get to go to lunch with them and then we will head over to the pool so the kids can swim. This sweet girl's mom and I did a book club together and got to be good friends as well. I am sure we are going to have a wonderful time! Have two projects for Emma's to share with you today. The first was a card based on this amazing photo that Anabelle picked out for us. The second project I have to share with you is a layout I did based on a sketch by Jill. Oh how I miss these guys. Jim and Jean were our closest friends in college. Thankfully we have been able to keep in touch over the years, although we don't see them nearly as much as we should. Their boys are just as wonderful as they are and we all had such a great time. We met them for dinner this winter when we were visiting my parents. Before we knew it dinner was over and we needed more time to catch up so we ended up taking the kids bowling. What a blast! I went for a retro feel with this layout. Just love all the Nostalgia stuff by My Mind's Eye. Thanks so much for stopping by today! Hope you have a wonderful day! First of all, happy anniversary! Love that cute pic of you and your hubby. :) The card is sooo pretty and I can totally see the inspiration piece in your finished product. The layout is really fun. 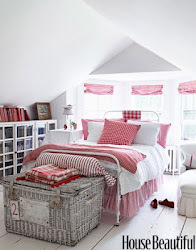 Great mix of colors! Happy Anniversary!!!! Totally adorable photo. I love the card and page. Awesome projects. love your style Lisa. great card and Lo!!!! Love the projects! Happy Anniversary too! First, Happy Anniversary! 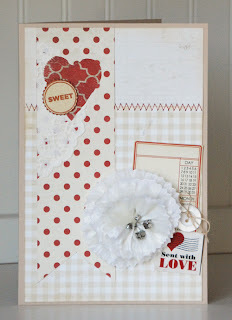 Love your card and layout. Great way to remember a fun memory. happy anniversary!! And love love love your card and lo!! Both gorgeous!!! I can see that you are as busy as always, Lisa! But what wonderful things you all have going on. 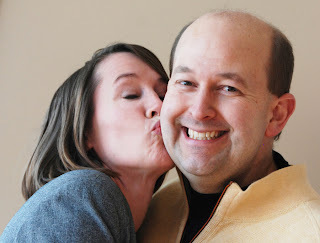 a very happy anniversary to you and your hubby and happy birthday to your daughter! Love your card and layout! 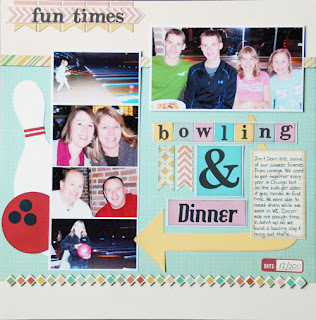 The bowling pin and ball die cut are so perfect on your layout, and I love your take on Anabelle's photo! Happy Anniversary and CUTE projects!